My name is Jason W. Dean and I am currently head of the special formats cataloging unit at the University of Arkansas Libraries, Fayetteville. I earned my MSLIS from Syracuse University. My undergraduate degree is from Hardin-Simmons University. I am also a member of the American Library Association, as well as the Art Libraries Society of North America. My interests outside of work are varied. I am very passionate about photography, not only the taking of images and the technical aspects but the philosophical and social implications of photography as well. I love to read, and I think I might qualify as a bit of a bibliomaniac. I subscribe to The New Yorker, The New York Review of Books, and Lapham's Quarterly. (To be fair, I also sneak reading Jen's Dwell Magazines and Paris Review in there.) I used to teach history to high school students and I am still passionate about both history and education - both in and out of the classroom. Finally, we share our home with a Saint Bernard named Winston. Scholarship and publishing: both the blessing and the curse of a tenure-track academic position. Of the three requirements for tenure and promotion, scholarship seems to be the most stressful requirement for many tenure-track librarians to meet. It is a frequent topic of conversation among younger faculty, reflective of the stress associated with this requirement. I feel that I’ve at least been able to keep up with this requirement (though others are far more active than I am) and so I’d like to share some of the things that have worked well for me. Furthermore, I want to follow my three points with some things I struggle with and am working on as a young librarian, as well as include a call to hear advice from readers. First, write about that which interests you. There is so much literature in the library and information science profession that is just not of interest to many people. Some of the best and most interesting writing comes from authors who are interested in and excited by their work – be one of those writers! Perhaps it’s some topic which is interesting, or an innovation or novel process that you are implementing at your library – whatever it is, write about it and find a good journal for it. Chances are that you enjoy your career as a librarian, but have a wide variety of other interests (we are a profession with broad passions and curiosities). Where do your professional and personal interests align? Last month, I attended a panel at which Jessica Pigza spoke about her book BiblioCraft – which is an example of what great things can happen when you find the intersections between your professional and personal interests – and then write about it! Second, though being sole author of articles is important for tenure and promotion, equally important to me has been collaboration on articles and other peer reviewed work. I feel very fortunate to have worked with some great folks on publications and presentations – and that collaboration made the finished product far stronger. Much of the work I’ve done collaboratively really could not have been done alone. Thinking about my first point, being passionate about what you write, it occurs to me that you might have some great, big idea piece you’d like to write. Part of it is very much in your area of expertise, but much of it is not. This is a perfect opportunity for collaboration. Invite the person that can speak to the areas where you feel less knowledgeable to be a co-author. I’ve met some great people this way, and have vastly expanded my own knowledge. It’s also a great way for a new professional to get one’s name on a wider stage. Third, managing my writing and publication has been key for me. It’s important to always be writing, and to show progress, so that at the end of the tenure clock you aren’t trying to write a multitude of articles and hoping they will be accepted and published. For me, this means I am trying always to be active on three tasks: waiting on review of articles I have submitted, actively writing an article, and developing ideas and collaborations. Having some kind of sequencing like that is helpful, but presentations and articles don’t write themselves, and don’t appear magically out of the air. Perhaps sharing how I write and craft new ideas will be helpful to you, reader, and will also prompt you to share ideas with me (and the wider audience) that will improve our writing processes. For me, writing begins with a very rough idea. It might come from something I read, an art work, a presentation, or even a movie. Always being open to blending things in and outside libraries has really expanded the pale of what I write about. Drawing parallels between libraries, and say, the work of Wes Anderson (I’d love to read that article) for example. When I have an idea, though, I need to write it down before it vanishes from my mind. Next for me is refining that idea by talking informally with knowledgeable people in and outside of the library. What things are interesting to people? What things work? Listen, and be willing to adjust your original idea – or abandon it altogether. When I feel like I have an idea a bit more refined, I am usually very excited to start writing – and that’s exactly what I do. Riding those waves of inspiration and excitement gets the majority of my first draft finished – but deadlines for draft submission (and tenure requirements) help. Blocking out time when you are writing is essential to me (as is having a clean workspace). When the writing is finished, my first draft is typically awful – and I try to step away from it. Give it to some people you trust to look at – for me revision is key in refining my flow and points. I try to listen earnestly to the feedback, and swallow my pride and address the comments – even if that means a very thorough revision. Repeat the process of review and revision a few times, and something approaching a finished article or presentation is the result. As I mentioned above, it’s not all quite dancing and happy times when I am writing (and I am certainly no Gene Kelly). My first point above was about finding where your interests overlap, which seems fairly simple prima facie. However, finding the area of overlap between your personal interests and the expectations for areas to publish about in scholarly journals is a bit more difficult for me. It’s especially hard for me – blending the tenure expectations of my job with writing for my PhD and then finding where that small area overlaps with my personal interests is very difficult. I would be really interested to hear what ideas you readers might have about that, and more broadly where, and how, you find positive overlap for scholarship. Beyond finding that intersection of personal and professional interests, follow-through is also a problem for me. I have a hard time after the initial blush of interest starting to write. How do you all bridge the gap from idea to actually writing? Finally, I frequently have ideas for scholarship that are broad (and inspired by people that inspired me) that I need to invite collaborators. It can be hard for me to swallow my pride and ask people who I deeply respect (and am a bit in awe of) to work with me. Do you all have any strategies on asking people to collaborate, and doing that collaboration in the best way? I’d like to conclude with an invitation to you, reader, to share what works well for you (and what doesn’t) in the scholarship arena! Perhaps together we can reduce the stress we all feel about this area of tenure and promotion! Author Jason W. DeanPosted on July 25, 2014 July 24, 2014 Categories Academia, First Year Academic Librarian Experience1 Comment on Publishing!? 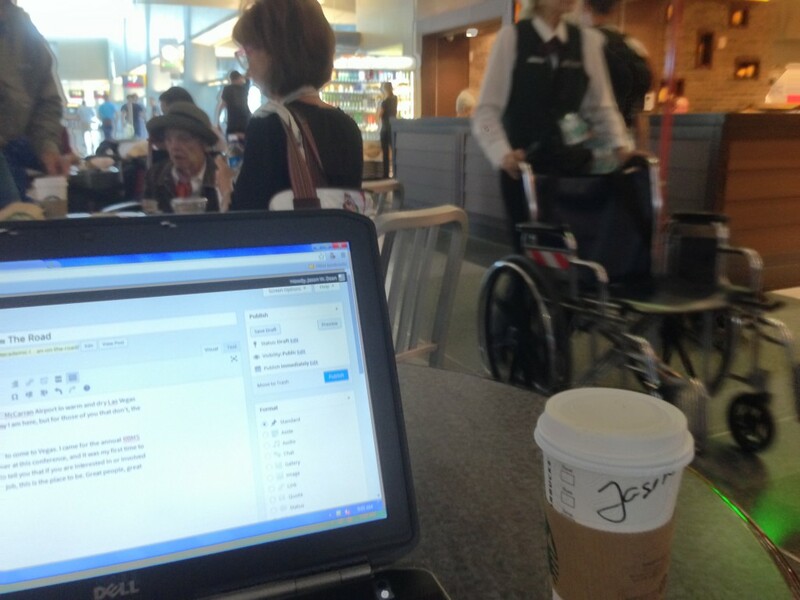 This post is coming to you live from the McCarran Airport in warm and dry Las Vegas Nevada. I imagine many of you know why I am here, but for those of you that don’t, the annual ALA meeting is here, concluding mid-week. But ALA was not my primary motivation to come to Vegas. 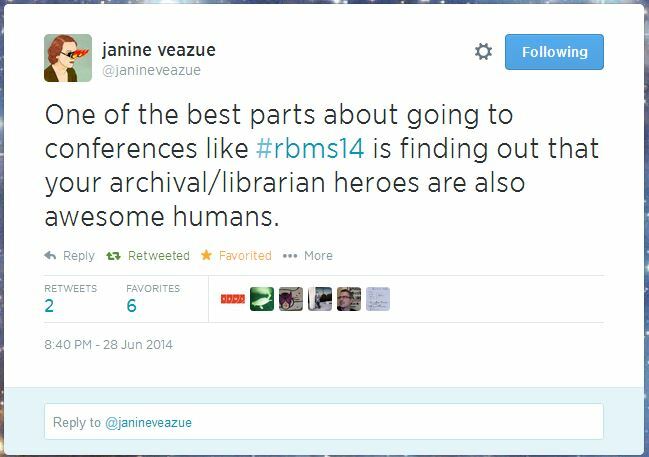 I came for the annual RBMS preconference. 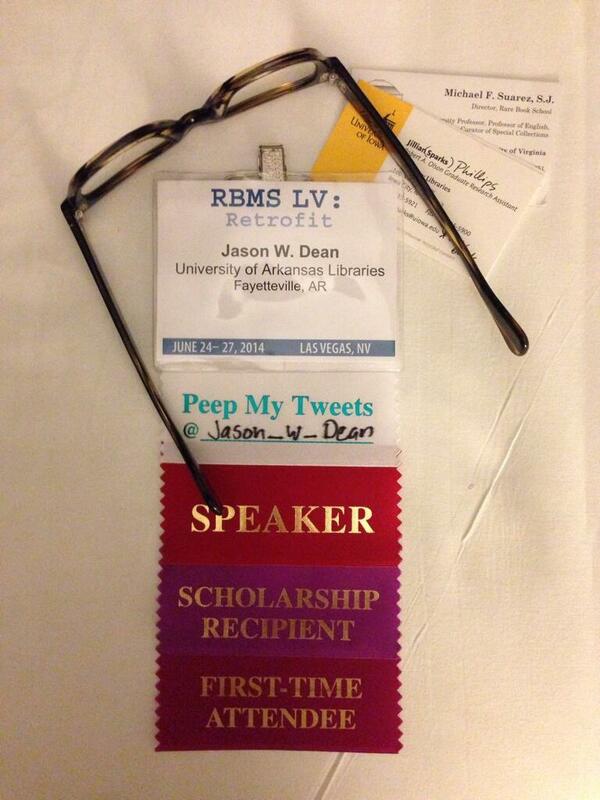 I presented my first paper at this conference, and it was my first time to RBMS as well. Before I continue, want to tell you that if you are interested in or involved with rare books or manuscripts in your job, this is the place to be. Great people, great research being shared and plenty of coffee! 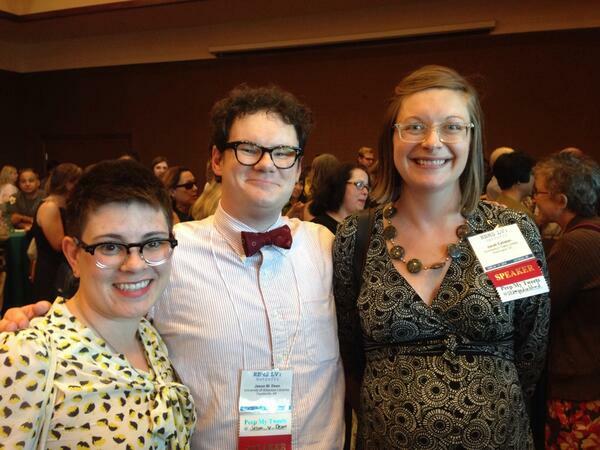 If you’re already an ACRL member, the pricing hurdle is not onerous at all, so think about joining! Anyhow, I have a suspicion that many librarians are at least somewhat introspective and find new social situations a bit challenging – I certainly do! That said, this was the most at-ease I’ve ever felt at a conference, and I was a first-time attendee. For me as a new academic librarian three things were especially useful in meeting people and making the most of the conference. First, remember that everyone at the conference is in the same social boat, so to speak. Conferences are filled with people who don’t know others at the conference, and hope to meet some great people. Of course, some folks have contacts and colleagues already made at the conference as they might be long time members of the organization and longtime attendees. That said, everyone at the conference is happy to meet new people, and the typical social rules regarding new situations are relaxed. Go introduce yourself and find a mutual connection. Third, jump in. Simply because you are a first-time attendee doesn’t mean your voice and work is not valuable. There is so much work done at conferences that listening to what is going on and attending open conference meetings that are of interest is a great way to start giving back, even during your first conference! Alternatively, think about presenting at the conference. I was honored to present with Sarah Burke Cahalan about research we are doing on a botanical artist who lived in the Ozarks. In seventh grade, my English teacher required us to read a book each month and write a report on it. Naturally, there was an approved list of titles one could choose from, and on it were the works of Agatha Christie. My suspicion is that I’d seen one of the Poirot episodes on A&E and that piqued my interest in reading the works of Christie. Her Poirot novels I read in seventh grade were my entree into the detective novel genre – one that I enjoy to the present day. It’s a love I share with my wife and Saint Bernard, as many evenings find us at home crammed on the couch watching one or another episode of a detective show. Poirot, Sherlock (both the Cumberbatch and Jeremy Brett incarnations), and Nero Wolfe are among our favorites. Recently, however, our show of preference has been Foyle’s War, set in World War II Great Britain. Many elements make this a great program – Michael Kitchen’s acting is excellent and the intro theme is lovely – but most interesting is the collaboration between Foyle (Michael Kitchen), his driver Sam Stewart (Honeysuckle Weeks) and his Sergeant, Paul Milner (Anthony Howell). While Foyle is, in typical detective genre style, the “brain” behind it all, he would not be as successful without Sam and Sgt. Milner. In my previous position, I worked closely and collaborated with the librarians who are now my colleagues here at the University of Arkansas. At a fundamental level, working well with others gives you a good reputation in the library community, both locally and globally. If that collaboration had not existed and been a positive one I would more than likely not have been selected for the position I am in now. That is, admittedly, a selfish way to think about collaboration – and as members of the academy, we strive for service to that academy, as well as our respective disciplines. Most of that work is carried out in committees – to my mind a formalized collaboration. And as it’s something many of you have had experience with I will not spend any more time writing about committees. No, what I have in mind are the less formal collaborations one participates in. For me these informal collaborations make my work richer in two very tangible ways. First, with a fellow cataloger here as well as a library specialist, I wrote an article currently under review at Cataloging & Classification Quarterly. The article details our method for handling electronic theses and dissertations, and is much richer with their contributions and ideas. Also, I don’t know if I could have written the article without their help and prodding! Second, in collaboration with Sarah Burke Cahalan of Dumbarton Oaks, I am presenting at the RBMS preconference in Las Vegas about an under researched scientific illustrator who spent most of his career in the Ozarks. This presentation and research would not have been possible without Sarah’s work with the artist’s family and her work with institutions in her area that hold work by this artist. I am immensely grateful for her work in making our research about the artist far better than that which I could have done on my own. As an aside, I will also say that our library administration really appreciates these collaborations – especially with other outside institutions. So these collaborations are indeed valuable and helpful to the first-year librarian. What can you do to facilitate these collaborations? First, listen. Listen to the research interests and areas of your colleagues – academics love nothing better than to talk about their own research. Second, reach out. I never would have met Sarah if it weren’t for twitter. It’s important to have an active professional presence in whatever social media arena you feel comfortable in. Third, don’t be afraid of asking – the worst that could happen is that a potential collaborator could say no. Finally, my charge to you is to start some form of collaboration next week. Identify and have lunch with a faculty member on campus about a shared research interest. Reach out to your “research hero” at another institution about that great idea you’ve had. But most of all, do it all with an upbeat attitude and a kind smile on your face! Almost every morning I come in the west side of the building, the original entrance for Mullins Library. On the way to my office, I pass a travelling exhibition that is here for the spring semester – a display of books from the Remnant Trust. As a part of my service activities for the library, I volunteer to lend a hand when needed with the collection. There are several times during the week that patrons can request to see and handle the books, which is always a delight for me. As I am a cataloger, my office is in an area that is generally off-limits to most library patrons: technical services. The term off-limits makes me cringe a bit, but there is very little of interest to most patrons in the technical services area – lots of cubicles, dot-matrix printers, and the occasional typewriter (including the one in my office). Oh, and several shelves full of bibliographies and cataloging reference books. The utilitarian look of this area is in contrast to the more welcoming look of the patron-centered areas, and so we see very few patrons amidst our technological antiquities. Working with the patrons who request to see the Remnant Trust materials has been a welcome change for me. These patrons are a reminder to me that everyone in the library, even we metadata wizards in technical services, works to serve the needs of our users. For me, it’s an easy point to forget about, or neglect; so working with patrons from time to time has been a welcome change and reminder of the service-centric nature of our profession. Indeed, as a cataloger, working with and listening to patrons makes my work better as the metadata I create and use can be better tailored to our patrons based on their feedback. Of course, the reference librarians and staff are the first point of contact for many library patrons. Their mastery of the resources in their libraries and collections makes them well-suited to serve users. Those of us behind the scenes serve users with the work we do in describing resources, acquiring new items, and providing access to items in our collections. However, librarians are also charged with the responsibility of providing for future patrons – collecting and preserving those things that might have significance for those that come after us. This can take many forms, but the books in the Remnant Trust exhibit would not exist if it were not for forward-thinking collectors and librarians. I decided to make a last stop at the Boston Athenaeum, one of America’s great book places and home of a magnificent research library that itself has been a work in progress since 1807. There, I not only turned up the three elegantly printed volumes on a remote shelf in a basement storeroom, but found them in remarkably pristine condition, with pages that had remained uncut, and presumably unread, after all this time. As I was signing the books out at the front desk – the Athenaeum did not yet use a scanning device to record loans to its members, although that quaint practice was about to change as well – I confirmed by the blank cards tucked inside the rear pastedowns my assumption that they were, in fact, leaving the library for the first time. “Eighty-one years,” I said aloud, shaking my head with amused gratitude. “You wonder who they bought these books for anyway.” James P. Feeney, the silver-haired circulation librarian who was checking me out, paused momentarily and fastened his unblinking eyes on mine. “We got them for you, Mr. Basbanes,” he replied evenly, and resumed his work. It is this faith that we take part in as librarians in any and all parts of the library: reference, administration, technical services, inter-library loan, and many others. The faith that we will do our utmost to serve our patrons both now and in centuries hence. The line at the end – we’re not doctors – brings me back to my first post here in October where I touched on the idea of feeling a bit out of place with the wider faculty – something like a pretender. Still, being librarians in the wider academic community of campus is an important part of our roles. Indeed, making use of these collegial connections is important to our success as members of the academic and library communities. My mentor and I attended a faculty lunch this past Friday where I knew several of the more senior faculty members there from across many colleges on campus. These connections not only give one an opportunity to be a representative for the library and share pertinent tools and services the library might provide to teaching faculty and students, but these connections can also foster cooperative research across the colleges. Beyond these immediate benefits, being more “plugged in” to the wider campus makes the librarians more visible in general, and keeps subject specialist librarians aware of current trends in research not only on the local campus, but within their wider respective disciplines. Moreover, being a faculty – a whole faculty – creates a sense of community for all the involved parties – faculty, staff, students, and administration. This faculty community is responsible for the teaching and learning aspects of campus life, and so should come together not only to talk about the pedagogical aspects of that life, but also the scholarship aspects as well. Teaching faculty have many formal and informal opportunities to be a larger community, but librarians can be left out of this process if we don’t make sure we take part. 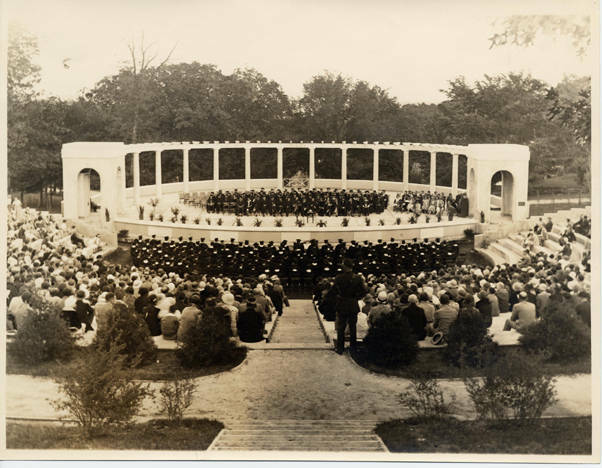 Commencement in the Greek Theater at the University of Arkansas, Fayetteville, 1933. Image credit: Special Collections, University of Arkansas Libraries, Fayetteville.